NBA: can you see the game through the sugar-coating? I like the USA, and I respect the USA. And oh! how much some things about the USA irritate me. Good examples are the amount of red color used in street advertising, and the two kinds of advertising during Good Morning America: cancer drugs and life insurance. Both types of commercials usually show a green park or meadow with a happily married couple are taking a stroll, with children, grandchildren, and a golden retriever prancing about. Add a soft filter for idyll enhanced. 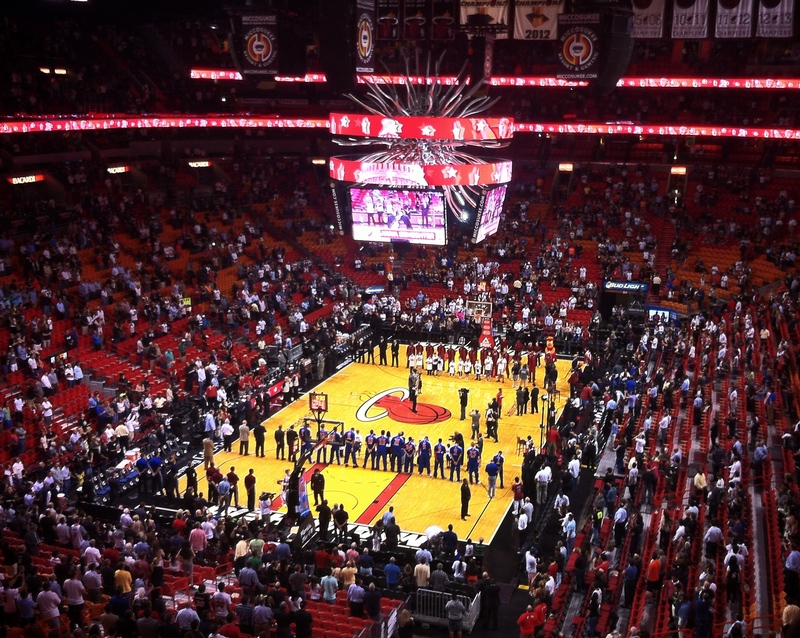 I digress: the photograph above shows a basketball match; more specifically, Miami Heat against Detroit Pistons. Apologies, and to the point: during a game spiced with dramatic video backdrop, hero music, pyrotechnics, and a seriously warped commentator, how can the players concentrate? And is this a game, or a game sugar-coated into an action movie with heroes on both sides, and no bad guys? How much does the game weigh in the adrenaline rush of the spectator, and how much the sugar-coating? Perhaps it is all irrelevant: all sport is business, and all business is show business. And boy, do the Americans know show business. Categories: Travel | Tags: Florida, sport, USA | Permalink.